Of course, you’ve probably guessed that neither is necessarily better. There are pros and cons to both. There are sailors that love their fractional rigs and those that prefer masthead rigs. 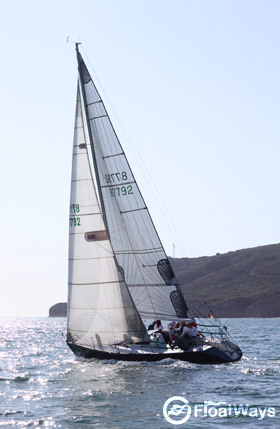 The fractional rig is very popular amongst racing sailboats. Essentially, a fractional rig has the forestay attached to a point a ways below the top of the mast, instead of the top (or close to it). This creates a headsail area that is a fraction of what it would be if the forestay were attached all the way up the mast. This in turn makes is so that the larger portion of the total sail area is in the mainsail rather than the jib. It makes the boat somewhat easier to manage around a racecourse because the crew is now dealing with a slightly smaller jib. Because of the position of the forestay in relation to tension coming from the shrouds, adding tension to the forestay can add bend to the mast. This can result in a flatter mainsail with less healing forces. This can be both good and bad. A fractional rig is more difficult to tune and often requires constant tuning to adapt to different wind conditions and sail changes. This is because the shrouds act as backstay tension instead of a standard backstay. The shrouds must keep the mast in column and control forestay tension – in other words, they are performing multiple jobs. Finding the right balance of tensions becomes quite a bit more complicated. Another problem with fractional rigs is that they require spreaders that sweep back. That is really not that big of a problem until you are going dead downwind and want the mainsail as far out as possible. The mainsail touches the spreaders and starts to chafe. For this reason, the crew in fractional rig sailboats usually let out the mainsail until it lightly touches the spreaders instead of letting it all the way out. Here's a great example of a masthead rig sailboat. Notice how the headsail is attached almost all the way up the mast. So masthead rigs are better? Not necessarily. Mast head rigs are more common on cruising sailboats and can be considered a more traditional way to rig a boat. On a masthead rig boat, the forestay attaches all the way up the mast and usually has a backstay that directly opposes it. The benefits of the masthead rig are simple… They are much easier to tune and some consider it a more secure rig. For this reason, many long distance cruisers prefer them. The masthead rig is a setup that can usually be “set and forget.” Once tuned, there is not much retuning needed unlike with fractional rigs. Masthead rig boats will tend to have a smaller mainsail and larger jib or genoa. This will result in a boat that’s a bit harder to tack and maneuver around a racecourse. At the same time it will have it’s own defining characteristics that add to the personality of the boat – Again, not necessarily a bad thing. However, it’s important to understand that simply because a sailboat has a fractional rig it doesn’t mean it’s designed exclusively for racing. By the same token, just because a boat has a masthead rig, it’s not necessarily a cruising specific boat. There are plenty of cruisers and racers that use both types of rigs. In the end, it falls in the hands of the boat designers and what you prefer for your boat. Whether you are going to cruise it, race it, or both.